Before I knew how many projects I was going to have this winter, I signed up for a year-long series of prompts called Documented Life. I'm keeping track of the prompts, and will eventually catch up. I actually did week 7 this week (they are on week 10) - in which I was supposed to look at Pinterest for inspiration for a journal page. Full participants used Moleskine planners to make their journals. I made folios of sketchbook paper and will fill them as signatures and then bind them into one book at the end of the year http://www.paperandthreads.com/2014/01/beginning_of_a_new_year.php. 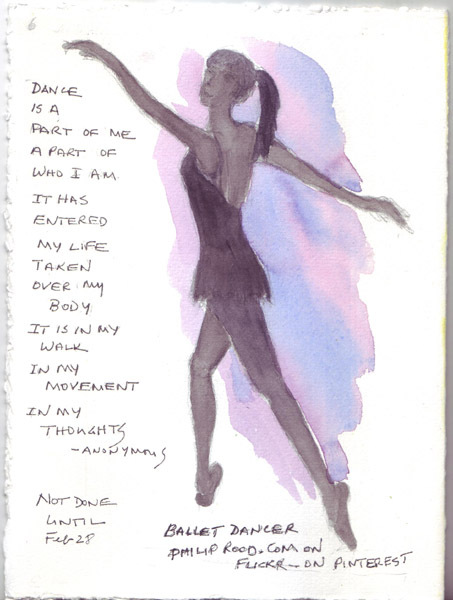 I wanted to document my continual attendance at ballet class - 28 weeks since I restarted dance during the summer! And I found a lovely photograph by Philip Rood that inspired my watercolor. This photo "pin" was attributed to Philip Rood on Flickr. The quote was on another pin with no attribution. There is a break this week in our lessons in the Studying Under the Masters course, so I decided to post information about my other Winter activities. 1. 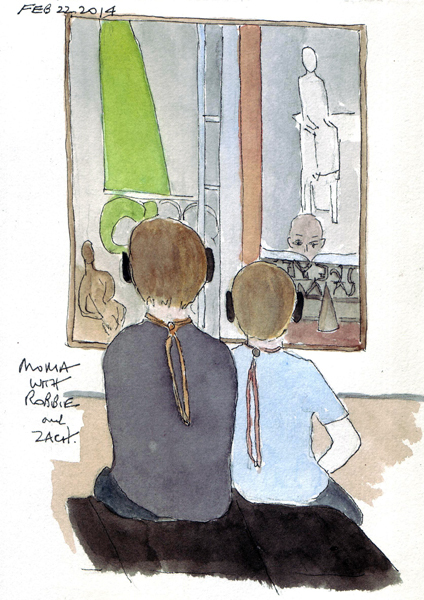 Our grandchildren: We took 8 year old Robbie and 4 year old Zach to the Museum of Modern Art last week to listen to the Children's audioguide. The museum has short, interesting commentaries for about 15 of their major art works in the permanent collection. Here they are listening to the commentary about Matisse's painting The Piano Lesson. All of our grandchildren love to do this. 2. Surface Design: This semester I'm taking a surface design class at Fashion Institute of Technology (FIT) - fifteen 4 hour lab sessions using dye to paint on silk. I have some experience with these techniques, but thought it would be fun to study with an artist from FIT. 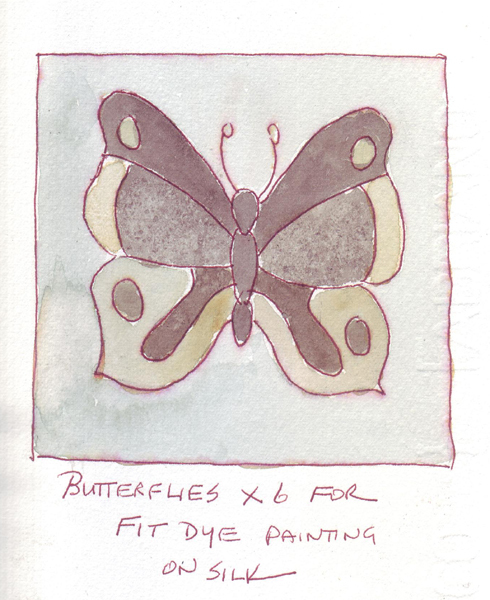 Here is a watercolor painting of one of 6 butterflies that I "drew" with gutta and water soluble resists on silk and painted with Sennelier dyes. I also painted it as a watercolor so I would have an entry in my daily art journal. 3. 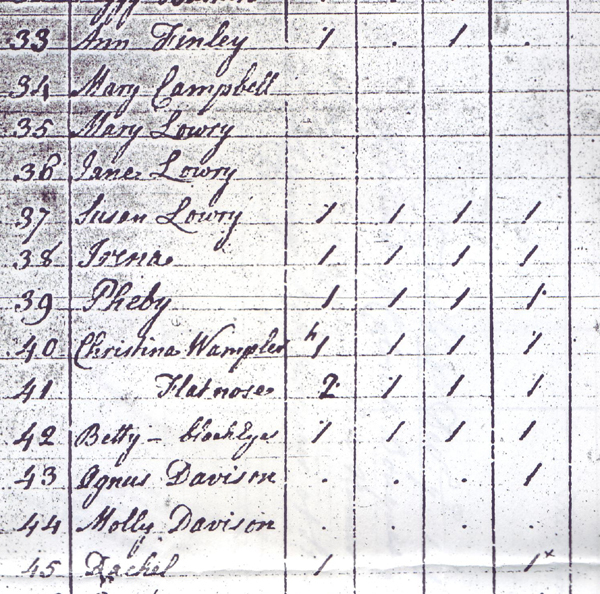 Family Research: I signed up for Family History Writing Month in February and decided to write a story (at least 250 words per day) about my Great-great-great-great grandmother Christina Wampler. She was kidnapped by the Delaware Indians in Lancaster Co. PA in 1757, during the French-Indian War, and was returned with 206 captives to Carlisle PA in 1764. The British took 1500 soldiers to the Ohio Valley to force the Delaware, Shawnee, and Mingo Indians to sign a peace treaty and return their captives. Her kidnapping and return were both reported in the PA Gazette (Benjamin Franklin, editor) and here is part of the handwritten captive list that I obtained from the Clements Rare Manuscript Library at the University of Michigan. She is #40 on this scanned portion of the list and was returned with one shirt, 1 legging, 1 shoe pack and 1 blanket. I don't know her age when she was kidnapped, but the fact that she was able to tell soldiers her full name after living with the Indians for 7 years and speaking their language, makes me assume that she was probably older than 4-5 years. Notice a captive named Flat Nose right below her - this is obviously a name given by the Indians. There are also captives listed with only their first names. She married Peter Graybeal, had a large family, lived in Ashe Co, NC and died in Jackson Co. Ohio. I'm hoping that someone with more information about her may find this entry in a Google Search. I exchange information with other Graybeal descendants, but there is so much more to learn. This is my painting that was inspired by Chagall. 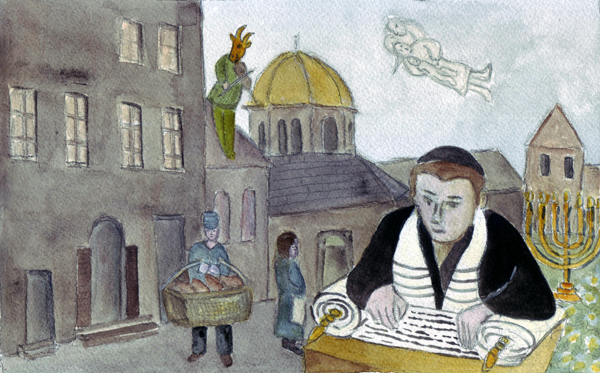 I did family research on my husband's Jewish ancestors more than 10 years ago and decided to try to make this painting a tribute to them. Both of his sets of grandparents were from shtetls in Belorus - one near Minsk and the other near Grodno. His paternal grandfather Sam was a scholar and came to America early in the 20th century, settling in New York City, His maternal grandfather Meyer sold grain in Russia, and was a peddler on the lower Eastside - after his arrival almost 10 years later than Sam. The buildings were drawn from a photo I obtained of the shtetl near Minsk. And there were multiple peddlers in the photo each carrying one of these large baskets full of bread. The fiddling goat to me means joy and the man, woman, and child represent all of their children and grandchildren who survived because they left Belorus before all of the people in their communities were murdered by the Russians and Nazis. 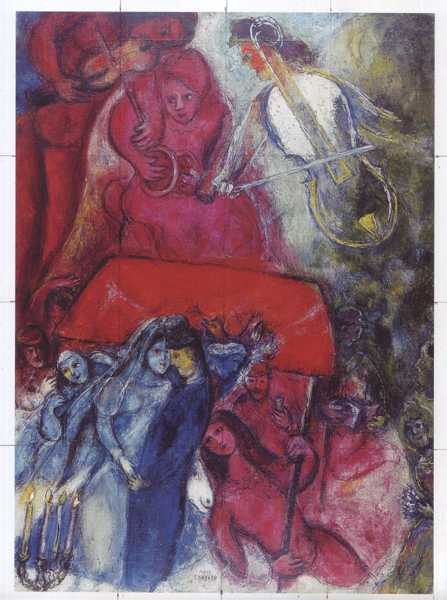 As we were starting our week studying and painting Chagall, I found this statement that Chagall made about his paintings, "I do not understand them at all. They are not literature. They are only pictorial arrangements of images which obsess me.... The theories which I make up to explain myself and those which others elaborate in connection with my work are nonsense.... My paintings are my reason for existence, my life, and that's all." from Frederick Hartt: Art: A History of Painting, Sculpture, and Architecture. My painting was done with Winsor-Newton watercolors on Arches 140 lb cold press paper. 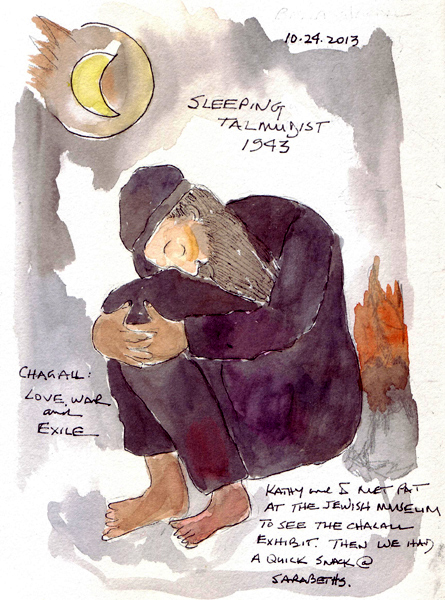 I love Chagall and recently saw a fantastic exhibit at The Jewish Museum of New York - with numerous paintings from his later years (Chagall: Love, War, and Exile). It is difficult to sketch in the museum from one of his complex paintings, but here is my quick, simplified sketch which I painted with watercolor when I returned home. I had a difficult time selecting a painting to copy for my online art class - some were way too complicated and others were too simple. During this course I try to select a painting that will stretch me a little and finally found this painting from 1944 - called The Wedding. 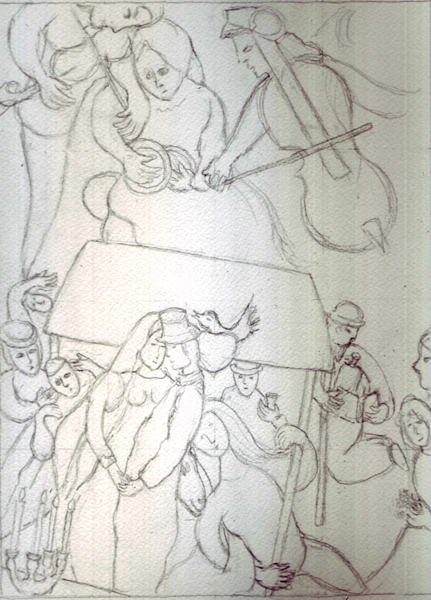 Only when I started drawing it did I realize that the couple were "under" a large red wedding chuppah - being held up by poles on the 4 corners. I made 3 quilted dye-painted silk wedding chuppahs for my 3 children - and was then even happier that I chose this painting. This is my drawing on 10 X 14" 140 lb watercolor paper - using graphite. Once I started painting, I was in the zone for the next few hours and totally forgot to take pictures. I like Katie's idea of setting a timer to remind us to take photos. And here is my painting - done with Winsor Newton watercolors, white gouache, and some black, red, and yellow gouache. This class has allowed me to experiment with gouache with my watercolors, expanding my horizons significantly since I don't use acrylic or oil paints. Next week we have a break - to catch up - and then have 3 more weeks and 3 more master artists. I haven't had time to keep up with my usual daily watercolor sketchbook and need to give it some affection! For my original painting done in the style of Georgia O'Keeffe, I debated between two of her types of images - New York City (my home) and a large flower. I finally selected this photo of mine and cropped it tightly like Georgia did with so many of hers. I did this painting completely in Winsor-Newton watercolors on Arches Cold Press 140 lb paper and scanned it on a flatbed scanner. The color didn't scan well, my paint is much more rosy than it appears here. I regularly forget to take photos at various stages during the painting - but this time did take 4 with my cell phone. Here they are. 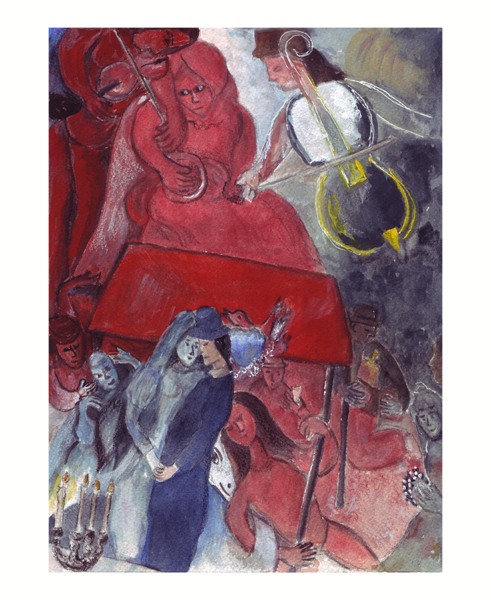 This course begins its 6th week tomorrow with artist apprentice Katie Kendrick presenting a week with her Master - Marc Chagall.